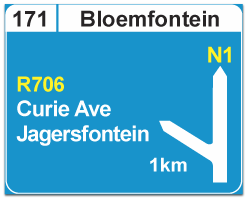 Where: On the left-hand side or in an overhead position on a freeway, about 2 km before an off-ramp exit. Purpose: To indicate early on that there is an exit from the freeway to certain routes ahead. Action: If you want to leave the freeway, move to the left hand lane in good time. 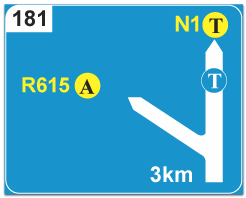 Where: On the left-hand side of a freeway, about 1 km before an off-ramp exit.